plus some lower laterals coming off of the branches. On the trunk and scaffolds I do not see any viable cambium. The bark is very thin with nothing that I can see inside of it, except wood. The bark is very tight to the wood. My first question is, in 9a will the bark start slipping when temps get warmer and if not how do I graft to this monster? The tree has not been pruned in years and there is nothing low except for the branches mentioned above with the addition of a bunch of water sprouts. Healthy ones accually. I did a google search trying to find out if I can graft to a water sprout. I don't see anything at all (maybe I am the first person to try it??). So, that is my second question. Yes, you can and one of my favorite ways to make cocktail trees on citrus, avocados and mangos. 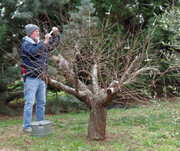 Peach tree example below but it's all the same. Recently I did 20 grafts, 4 varieties to extend the season (and you would know it today we have an ice storm) on a peach tree that I stubbed to 4 thick scaffold branches last year in order to get shoots to graft to this year. Last year I did about 50 citrus grafts on older trees - a few cleft but mostly t-bud. This 11 year old tree was 25' wide X 14' tall. Doing cleft grafts 2 days ago. I matched the scion girth to the shoots girth to try to get full cambium contact. Looks like the image feature is on vacation. I don't see my uploaded pix. I can see the photos. On the shoots that you are grafting to, I see buds and laterals I think. Are they fruit buds or vegitative buds? I would think that it is vegitative being that they are growing on water sprouts, right? Thanks Lory. I will do some more grating on it next year on new shoots but I don't want to waste some budwood that I have now. In the video, the guy is grafting to suckers and not water sprouts. Have you grafted to water sprouts before? I've grafted citrus and mango scions on new shoots coming up from cut main trunks, they seem to do a lot more vigorous than grafting to an existing regular tree branch. I have the scions in the refidgerator. I assumed it would be better to graft to the tree in the spring when it really takes off and then do more grafting in the Spring of 2020.